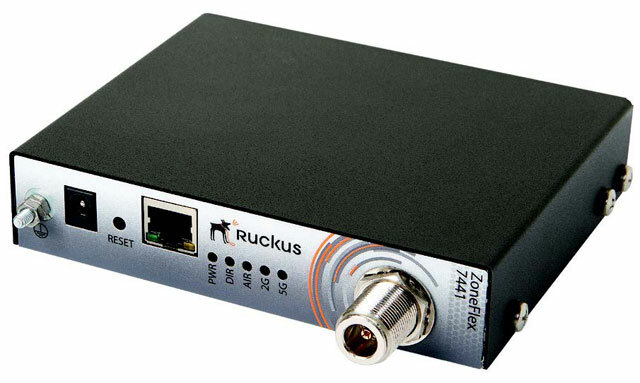 The Ruckus ZoneFlex 7441 has been discontinued. No direct replacement is available. The 2.4GHz or 5GHz selectable ZoneFlex 7441 is a fully featured, fully integrated platform, purpose built and designed to meet the demanding requirements for today's in-building wireless services. The ZoneFlex 7441 is an 802.11n 1x1 MIMO AP with an external N style coax connector designed to provide high-power RF and expanded link-budgets needed to push WLAN services over passive coaxial DAS segments. In cases where a DAS system has already been deployed, this is an extremely cost effective way to add Wi-Fi coverage. As Wi-Fi demand increases, it is always possible to come back at a later date and add a high-capacity Wi-Fi overlay network based on Ethernet backhaul. Note: 7441 is only available with ZoneFlex 9.7 and greater. 802.1n 1x1: 1, Single Band Access Point for DAS, 2.4 GHz or 5 GHz selectable, one 10/100/1000 Ethernet port, 802.3af PoE input or DC in, does not include power adapter. This part requires the purchase of WatchDog Support.